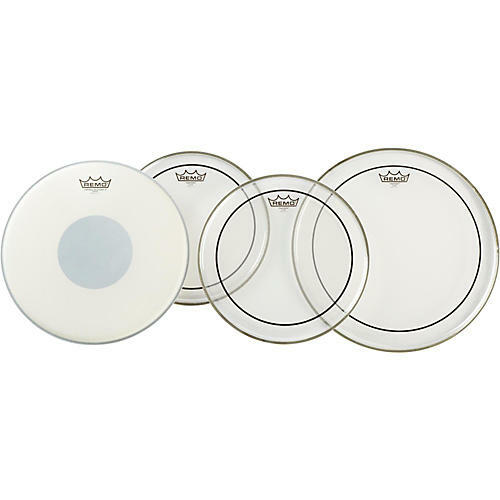 The Remo Clear Pinstripe Pro Pack with Free 14" Controlled Sound X Snare Head includes the Controlled Sound X Snare Head, constructed of coated 12-mil film with a 5-mil reverse dot for 20% more durability and tone control. The CS snare head delivers controlled mid range tones ideal for higher frequency snare drums. For your toms, the clear Pinstripe heads are made with two 7-mil Mylar plies for quick decay, making them ideal heads for the fat sounds of pop, rock and R&B. They provide a deep, low-pitched sound with moderate attack and response.